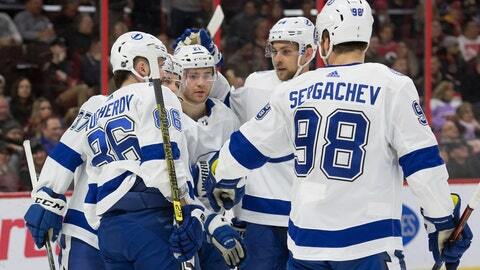 The Tampa Bay Lightning celebrate a goal scored by center Yanni Gourde (37) in the first period against the Ottawa Senators at the Canadian Tire Centre. Ottawa’s Mark Borowiecki missed his second straight game and Mikkel Boedker was a healthy scratch for the second straight game. Tampa was without Victor Hedman, who’s dealing with an upper-body injury. Tampa recalled goalie Eddie Pasquale from AHL Syracuse. Louis Domingue is dealing with a lower-body injury.